Joy Rose is a rocking female musician who also happens to have a bunch of kids. She founded "Mamapalooza" an organization to network with other "rocking moms" and her band "Housewives on Prozac". Mothers Who Rock – Rocking Moms – Birthing A Movement! How We’re Doing It. The interviewer shoves a microphone in front of my face, as my cell phone rings – A little voice on the other end wants to know when I’ll be home. I’m not a celebrity. Nor am I aiming for that. Or am I? 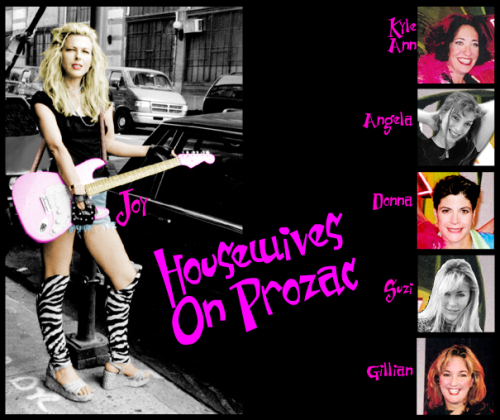 As founder of The HOUSEWIVES ON PROZAC Band, I’ve spent the better part of the last eight years on stage when I’m not mothering my four kids. Why? Since nearly dying in 1994 from LUPUS and then going thru a kidney transplant in 2001, I learned first hand about incredible healing properties of music. Simple and easy. After my fourth and last child was born, I landed in the middle of my own dark novel before going back out into the world imbued with a fervor for the healing properties of sound, and a kind of youthful zest normally enjoyed by people half my age. As the 47 year old mother of 4 kids, I wasn’t thinking about ‘fame’, I was thinking about getting off dialysis and saving a few more souls, just as mine had been saved. I was looking for ways to offer the Martha Stewart wannabes a kind of colorful zest that can be used in more than just cooking. These were the things I learned when I was bald and bloated on chemo and steroids, when red lipstick was the only way I could light myself up, and songs floated through my head long after the babies had gone to sleep. I was looking not to find the art in my surroundings, but the art in myself! I wanted to turn my whole living breathing body into a magnificent sashaying miracle. When other people noticed my enthusiasm, I was proud. Proud to have inspired them, just as I’m inspired daily by people around me. When I picked up a guitar and started strumming, I was happy when other people came to witness it, and then jumped on board, only to wake up years later in the midst of a rush of enthusiastic peers. I didn’t invent the idea of Moms Who Rock. We were always out there, busting at the seams of our too tight fifties sensibilities that didn’t exactly coincide with our college educations. I’ve struggled with similar issues at home and on stage, finding time to squeeze everything into an already overflowing life. Celebrating every moment even when the moments grow dull and monotonous, and it seems as if my car wheels are spinning in circles but, I’m not getting anywhere. Learning to love myself and the tiny beings entrusted into my care. It’s a full time life! I have a lot of feelings about The Mom Rock ‘Movement’ and all the attention it’s been getting. Someone recently told me they heard a NPR radio show and 14 new Mom-Bands have formed in this area since January. Are these people who are entrusting their passion to their art, or simply jumping on the ‘famous’ bandwagon? that has no top and no bottom? How do I distinguish myself, when the whole goal I set out to achieve was the kind of soulful abundance that is available to everyone, if they’ll just open their eyes to their own creativity? My Mother was a frustrated housewife. I was too, until circumstances laid a destiny at my doorstep that was much bigger than I ever could have imagined. "I left my husband so someone else wouldn’t have to." I said, nodding to the reporter. Somewhere in my head I believed if I’d started out my marriage as an empowered woman, I wouldn’t have ended up disempowering myself 18 yrs later as a mother and a wife. This may be overly optimistic. let alone middle-aged women, let alone mothers, let alone artists. The work force cannot ever completely prepare someone for the isolation, lack of financial restitution and mundanity that stay at home parents routinely face, and the raging sense of stuck-righteousness every mother needs to remind herself to let go of from time to time. The MAMAPALOOZA Festival was the only way I knew to give back to a life that has been overly generous to me. Now, as I face mounting costs, and the reality of single-parenthood, I’m faced with a whole different list of challenges. As I look for new ways to empower myself financially, I force myself to grow into a whole new kind of person. One who demands material rewards for hard sweated labor, both on my behalf and the behalf of other mothers. If I can do it, then so can you. So can my daughter. If I can find a way to slightly widen, expand and invigorate the role of motherhood, which is only part of my job description, then I’ve done a good job. If I can work the miracle of the moment by turning the banal into the extraordinary, then I’ve done a good job. If the world view of Moms changes to incorporate concepts of artistic, gorgeous, vivacious, intelligent, sexual beings living out their soul and passion collectively, and reverberates just a little more loudly, then I’ve done a good job. And so have you ….And you …..And you. It is up to each of us to examine the glass ceiling of our lives and stretch the perimeters of what is acceptable. Who determines ‘acceptable’ behavior, attire, attitudes? Is it an outdated patriarchy or the hierarchy of our soul calling? I can honestly say that to climb up the burning heap of nearly-famous, for the sake of being a Rock Star at any age, doesn’t interest me in the least. Or, least not the idea of being famous for famous sake. It is brave just to get out of bed everyday. Brave to feed the children when they call out. Brave to make the beds, start the car, and stir the pasta. Living is brave. Singing about it, doesn’t take bravery. It has takes blood and guts and madness. It is a messy business this show-biz life. The kind of madness that only a mother can safely negotiate in a truly heroic manner. I think we all know what it takes to make a hero? And what are Moms, if not Everyday Heroes? If this Movement is meant to be more than just a Baby Boomer s last whine, or a newer narcissistic heave of thoughtless mayhem to simply reduce stress, then there must be a collective energy softening and surrounding our consciousness. We have to work hard to blur the edge of Me, Me, Me and make it about Us . That s what wise women do. And, at the same time, honor ourselves enough to know when financial restitution is available– We will use it, and use it to our mutual benefit. Birthing a Movement isn’t easy. I suppose it is a lot like having a baby. There is lack of experience. Growing pains. The need for financial independence, and at the end of the day, the Baby doesn’t belong to any one person. The Mom-Movement springs forth as a result of all it is Mother’s best intentions — Every sister who has raised her voice and waddled her hips to a beat. We give birth to set our children free in the world. Hopefully, filled to bursting with ideas of what it is to have a full, fat, round, red human heart. and the years turn themselves into a more wrinkled version of what I once was, I find the kind of agelessness that is perhaps to subtle to shine out from beneath my laminated cereal box dress: "The day is ours to inherit. As I shine, may others shine. May I not take anything without giving something back, and may I humbly make my way in the world as a proud, bodacious babe of infinite abundance, leaving behind more smiles than pain, more friendship than solitude, and more harmony than discord. Previous PostPrevious AGE DISCRIMINATION IN THE MUSIC BIZ! BECOMING TO OLD TO ROCK & ROLL ?